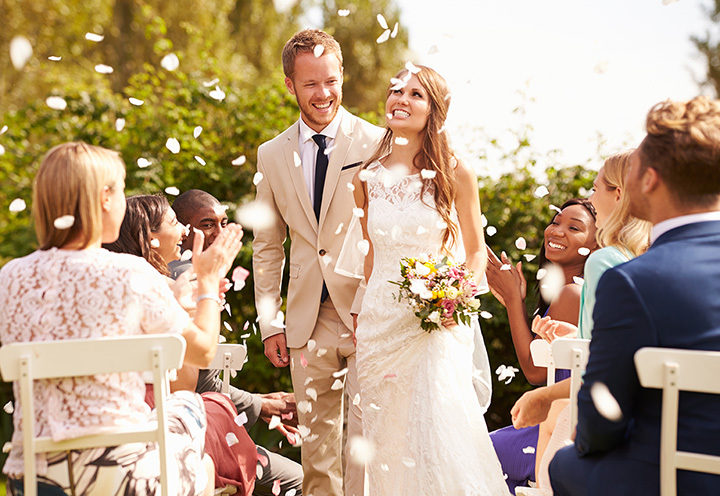 Your wedding should be memorable, and one of the best ways to ensure that your Big Day is a Big Deal is to pick the perfect place to have it. In Minnesota, we have so many gorgeous locations that choosing a location may be the hardest decision you’ll make when planning your wedding. These are our suggestions for awesome wedding venues in Minnesota! The Como Park Conservatory, which is comprised by indoor and outdoor botanical gardens, dotted with rippling fountains, is an iconic Twin Cities wedding venue. You can choose from half a dozen different spaces within the conservatory to make sure that your wedding milieu perfectly fits your day. Round Barn Farm is a bed and breakfast, but it’s also a stunning wedding venue located just outside the Mississippi River town of Red Wing. The grounds offer incredible views of the river valley, and the namesake round barn, with its soaring ceilings and rustic feel is a perfect place for a ceremony, reception or both. Home to the landmark Spoon Bridge with Cherry, the Minneapolis Sculpture Garden is gorgeous in its own right, but it also affords gorgeous views of the Dowtown Minneapolis skyline. Several private or semi-private spaces are available within the garden, which is a partnership between the Minneapolis Park and Recreation Board and the Walker Art Center. The James J. Hill Center has been a centerpiece of downtown St. Paul since it opened to the public in 1921. Gorgeous, columned interior spaces and huge cathedral-style windows make the center an awesome venue for an indoor wedding or reception. The Washington County Historic Courthouse—no longer in use as a governmental facility—sits high on a bluff overlooking the St. Croix River Valley and downtown Stillwater, the state’s oldest city. The space lends itself well for smaller weddings and can be configured as an outdoor or indoor (or both) venue. A grand estate on the shores on Lake Superior, Glensheen harks back to the Victorian age with its sweeping grounds and grand mansion. Whether you’re looking for a small ceremony at the boathouse with a bonfire, or have a vision of white chairs on the magnificent green spaces, you’re sure to appreciate the splendor of Glensheen. Part of an historic Mayo family—of the Mayo Clinic—property, the Mayowood Stone Barn is now one of the premier wedding venues in the Rochester area. Once a dairy barn, the stone space is more than a century and old and serves as a beautiful backdrop for weddings and other events. The Lafayette Club is on an incredible, 38-acre parcel of wooded land that sweeps down to the shores of Lake Minnetonka. The centerpiece is the 1925, Spanish-style clubhouse. Lafayette is a private club, but they offer their spaces to non-members for special events—like weddings. The Kitchi Gammi Club has been a Duluth icon since 1883. Also a private club, it is open to non-members for weddings and other special events. The historic building overlooks Lake Superior (hence the name) and is close to all that Downtown Duluth has to offer. They even have guest suites if the bride and groom care to linger. Completed in 1902, the Landmark Center was once the Federal Courthouse for the Upper Midwest. Now, it’s home to several gallery’s, a museum and a gorgeous event venue. Located in the heart of downtown, overlooking Rice Park, the five-story interior courtyard is breathtaking when staged for a wedding.